While Tesla’s stock price gained 6% this morning after a note from Deutsche Bank, short interest on Tesla’s stock increased to 21.3% of the outstanding shares. This is the highest level of short interest on Tesla in the past 13 months. 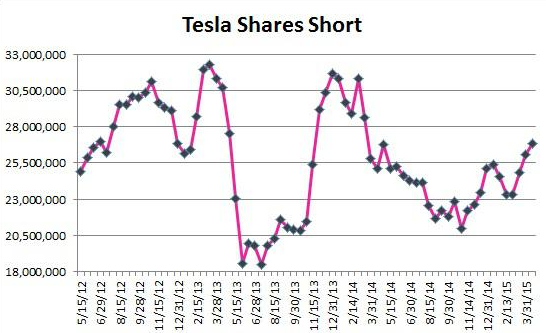 Short interest contributed greatly to the previous few surges of Tesla’s stock price. 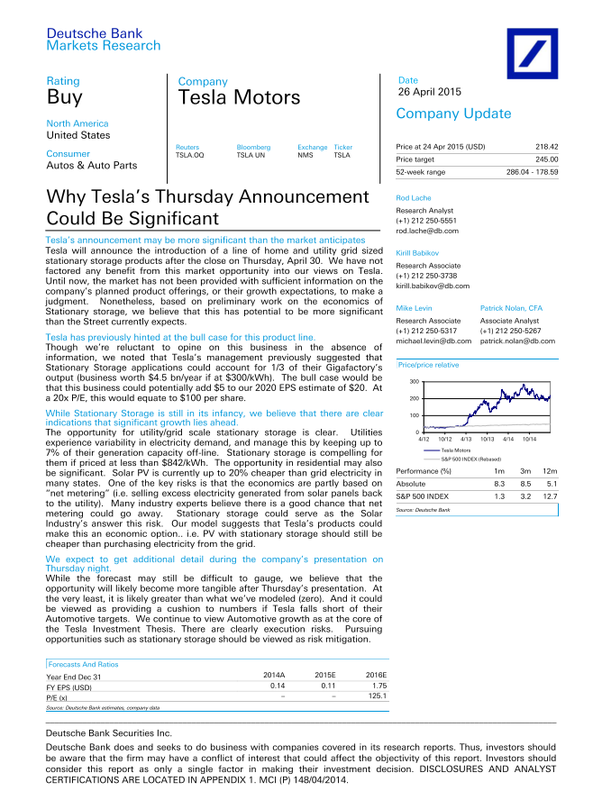 In early 2013, short interest was over 30 million shares when Tesla reported a profit. Investors started covering their short position, which created a lot of demand for Tesla’s stock. Tesla is holding an event Thursday to announce their home energy storage products. Historically, Tesla’s stock price increases prior to an announcement and then decreases after the event. This is commonly referred to as “buying on the rumor and selling on the news”. So far, this current event is not an exception with Tesla’s stock price gaining over 20% since Elon Musk tweeted about the upcoming event to be held at Tesla’s design studio in Hawthorne. We have not factored any benefit from this market opportunity into our views on Tesla. Until now, the market has not been provided with sufficient information on the company’s planned product offerings, or their growth expectations, to make a judgment. Nonetheless, based on preliminary work on the economics of Stationary storage, we believe that this has potential to be more significant than the Street currently expects. Tesla has previously hinted at the bull case for this product line. Though we’re reluctant to opine on this business in the absence of information, we noted that Tesla’s management previously suggested that Stationary Storage applications could account for 1/3 of their Gigafactory’s output (business worth $4.5 bn/year if at $300/kWh). The bull case would be that this business could potentially add $5 to our 2020 EPS estimate of $20. At a 20x P/E, this would equate to $100 per share. It will be interesting to follow Tesla’s stock price leading to the unveiling.